Entries have just closed for New Zealand’s NRM National Three Day Event in Taupo next month, and some hot competition is expected. Donna Smith will be back to defend her title with Balmoral Tangolooma at the event, from May 15-18. The pair were clear winners last year but will have a challenge on their hands given the quality of this year’s field. Eventer of the Year Clarke Johnstone has entered Balmoral Sensation and while not achieving the result hoped for at the recent Sydney International Three-Day-Event, he will be keen to put the Wills trophy for the CCI3* NRM Open National Championships in his cabinet. Only two other combinations from last year’s class are back: Campbell Draper and Kahurangi Manu and Angela Lloyd with Song, both looking to improve on last year’s 6th and 8th placings respectively. Britannica MVNZ was fifth last year but will be ridden this year by Bundy Philpott. The pair have been consistent performers this season. 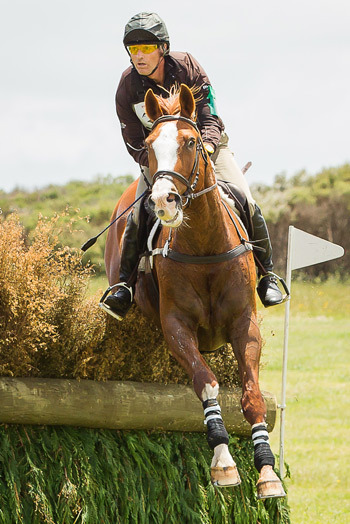 Matthew Grayling and Henton Executive claimed the Honda CCI3* at Puhinui in December last year so will be keen to repeat their success at this level in Taupo. Grayling will also have NRM Lowenberg there, and never one just to make up the numbers, will be aiming to quinella the field for sure. Samantha Felton has had an impressive season with Ricker Ridge Pico Boo and will be very competitive in their first CCI3* competition. Joseph Waldron and Springvale All Black have also gained many admirers since their recent return to New Zealand and will be looking to gain some compensation for a costly cross-country course error at Kihikihi. Shelley Ross, Kelsey Rothery and Abby Lawrence have also had consistent seasons and could well be poised to take home the winner’s cheque of $3000. Throughout the New Zealand eventing season, the competition at 2* level has been intense and it is shaping up to be no different at Taupo. There are 33 combinations entered for the Bates CCI2* Championships, the Picadilly Trophy and the $3400 total prizemoney. Bundy Philpott has three entered and Sophie Wilkinson, Samantha Felton and Dannie Lodder each have two horses in the field. The Mamaku Trophy is for the winner of the Fiber Fresh CCI1* Championships. There are 48 entered in this event, and it really could be anyone’s trophy. Other classes being contested include the Thomson trophy for the CCN105, the CCI1* Open and the CCN105 Open The National Young Event Horse Championship will be held on Friday, May 16, and always attracts some talented youngsters. The Silver Spurs Trophy always creates a lot of interest. North takes on the South Island, and there’s always a lot of good natured rivalry here. There is a strong South Island contingent making the trip north including Brent Jury, Emily Cammock, Ellie Braddock, Larissa Srhoy and Davina Waddy, fresh from winning the National Three Day Event Junior Rider Championships. A new prize on offer will create even more interest for those competing on thoroughbreds. The Thoroughbreds in Equestrian Sport (TiES) prizes will be awarded to the highest placed qualified thoroughbred in the CCI1* class. There is also a NZPCA Award for the highest placed Pony Club rider at the event. Being the final event in the season, it also means that it is the final competition for all of the ESNZ Eventing Series. With double points on offer, it will have a big influence on the final result. The series include the Super League, AMS-Erreplus Pro- Am, Amateur, Massey University Young Rider, Alltech Junior Rider and Weatherbeeta Grassroots Series. John Nicholson has been course building at Taupo since 2011, and is never one to sit still so expect to see some new and surprising changes to the CCI3* and CCI2* cross country course and fences. Chris Lever, from Wairarapa, is the new designer for the CCI1* and CCN105 cross country courses, and the photos show that there has been plenty of work going on there too. Two Australians will be officiating: Lyn Roycroft is President of the Ground Jury for CCI2* and CCI3* classes. Brendan Croese is TD for those classes as well. President of the Ground Jury for other CCI1* is Stuart Bishell and Winky Foley for the CCN105. As well as all the horse action, there will be many trade and catering stalls on the grounds. Taupo is always a social event, the last chance this season to catch up with eventing friends from all over the country. The warm marquee complete with bar and seating will be one of the social hubs and is the venue for Saturday night’s Young Riders fundraising dinner, followed by DJ and dancing. NRM are sponsoring the Pizza night on Thursday in the truck park and there will be a Wairakei Resort lunch for owners of the horses in the FEI classes on Friday at the Charisma Hall. Cross-country is on Saturday, showjumping Sunday May 18 after the final trot up, for which there will be some great prizes for the best dressed!